Prepare your Canadian population, public health, health promotion, and nursing students for effective community practice. 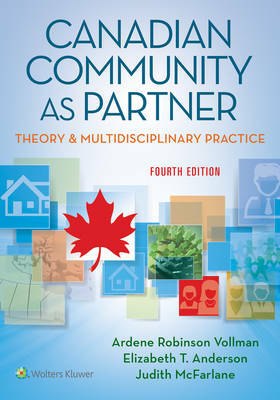 Reflecting the challenges of community practice in todays diverse society, this 4th Edition of Vollmans easy-to-read text helps Canadian community health practitioners and students make the paradigm shift to community as partner. This acclaimed book presents the Canadian Community as Partner Model in the context of population and community health promotion. Section 1 provides the foundation for community and population health practice, which is detailed in Section 2. A unique third section demonstrates how the Canadian Community as Partner model is non-prescriptive, process-oriented, and can be applied in a variety of Canadian settings-from coast to coast to coast-with diverse populations, groups, and aggregates. Highlights of the 4th Edition: - All new case studies in Section 3 are drawn from actual Canadian practice and range from "Flood Disaster Response" (Alberta)" to "The Inunnguiniq Parenting Program" (Nunavut), to "Together Yet Living Apart" (Prince Edward Island). - An array of real-life, engaging examples bring theory to life. - Take Note boxes highlight key concepts as the authors take readers through the steps of the Canadian Community as Partner process from assessment to evaluation. - Critical Thinking Exercises throughout encourage review, reflection, and application. - An expanded array of teaching and learning resources on thePoint help students succeed and save faculty time. - All contributors to this edition are Canadian, representing Canada from sea-to-sea. - The text is multidisciplinary in nature, representing public health and health promotion professionals from all disciplines - as well as community members themselves.